Retirement card messages can be difficult card messages to write. You may feel a variety of feelings toward the retiree, and the retiree may feel a variety of feelings about leaving work. Keep these feelings in mind as you write a message. Wishing the person a great retirement and acknowledging their work years is the basis of a good retirement message. Here are some tips and examples of retirement messages that you can use to help you express what you want to say. Choose an example you like best for your deserving retiree, and then use the tips to make it better. Who are You Writing Your Retirement Message to? "Congratulations on your retirement. It has been a pleasure working with you. I am wishing you a relaxing, fun, and long retirement. Don't think too much about this place." "Dad, I am happy for you that you finally get to retire. I hope we can spend some more time together, and feel free to take your grand kids any time you want." Think about who you are to the retiree when you read through these retirement messages. Ask yourself if you think you fit the message. If yes, then use those wishes for your card. You are a person I really admire because you are a person who gets to retire. I'm wishing you a long, healthy, and happy retirement! I'm glad you finally get to retire. You deserve it. You've worked hard! You have been one of the best employees I have ever had. I know that you will be just as productive in your retirement pursuits. Good luck! You will be missed. I am glad you are retiring. I am planning on hanging out with you more now. Your work years are over. Now your fun years begin! I have to admit, I am a little jealous of you. I wish I was retiring. Your retirement is probably just as welcomed by the company, since you can now be replaced by someone much less experienced and less expensive. The reality is that you can never actually be replaced. If you put as much effort into enjoying your retirement as you have all the years you've been working, you’ll have an amazing, productive, dynamic and long lasting retirement. You deserve it! I'm glad you get to retire while you still have many good and capable years of life left in you! Congratulations! Now that you've gone through birth, crawling, walking, school, and many years of work, you can finally relax! As you move into this next chapter of your life, I wish you all the best. Life is so much better when you don't have to follow an agenda or set an alarm clock. You have spent your time doing valuable work. Now you can spend your time enjoying valuable interests. Every day is a weekend now! Enjoy your long weekend! 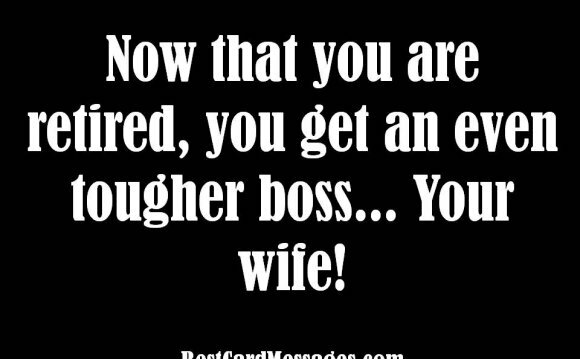 Use these funny retirement messages when you know the retiree well, and you know he or she can take a joke. Pick one you think the retiree will think is funny. Henryk Zygalski (Polish pronunciation: [ˈxɛnrɨk zɨˈɡalski] ( listen); 15 July 1908, Poznań - 30 August 1978, Liss) was a Polish mathematician and cryptologist who worked at breaking German Enigma ciphers before and during World War II.